Blog Tour, Excerpt and Giveaway! 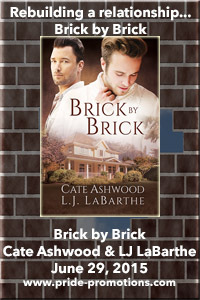 Brick by Brick by Cate Ashwood and L.J. LaBarthe | Because two men are better than one! Sixteen years later, Zach is thunderstruck when Parley stands on the front doorstep of his house—the house that had been their refuge, which Zach restored. But Parley isn’t alone, and Zach wonders if he’s found Parley only to lose him a second time. 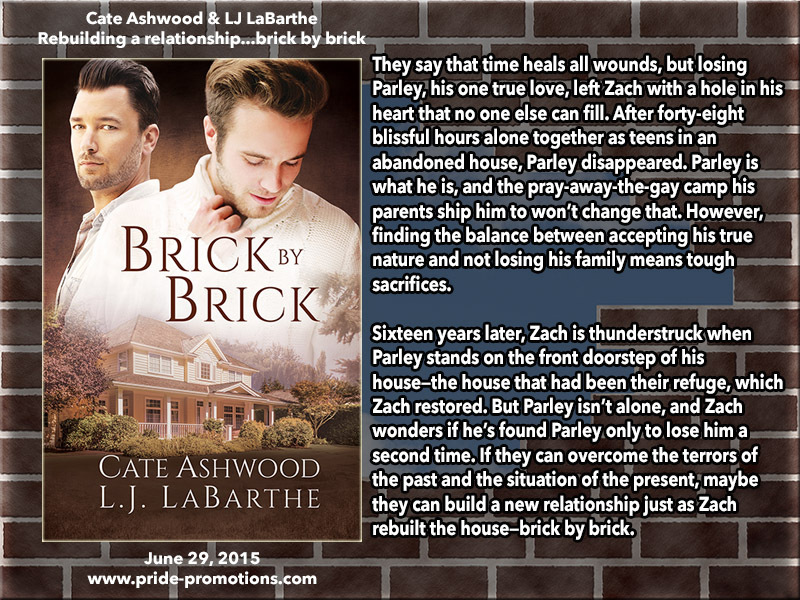 If they can overcome the terrors of the past and the situation of the present, maybe they can build a new relationship just as Zach rebuilt the house—brick by brick. ZACH FELT as if he was floating. He’d been planning this escape for weeks, but now that it was actually happening, it didn’t seem real. He chanced a quick look at Parley as they merged onto the highway. What could possibly be better than running away with his best friend? He’d had his doubts that Parley would actually come with him. After being turned down the first time, Zach had prepared himself for disappointment, but now they were leaving together and Zach couldn’t have been happier. “Where should we go?” Zach asked. He had some vague ideas in mind, but he wanted his friend’s input more than anything. “I don’t know. Somewhere we can’t be found?” Zach was right on board with that. “I still can’t believe you came with me,” Zach countered. “Or brilliant. 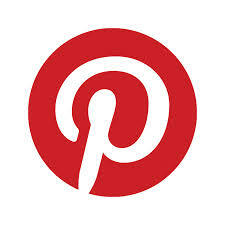 It’s usually a fine line,” Zach teased. Parley’s voice was quiet, barely above a whisper. Zach had seen him like this once before when he’d thought he’d lost his weird CTR ring with the spinner chain in the band. Congrats on the new release! Sounds like a great book! Congrats Cate & L.J on the collaboration. 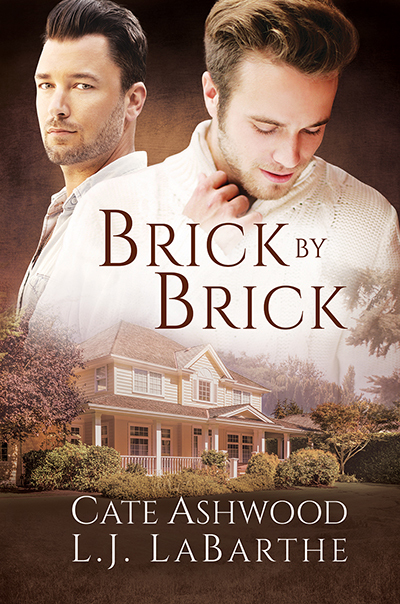 I am going to enjoy reading Brick & Brick.